This New York based artist is renowned for large scale, rustic wooden sculptural forms. 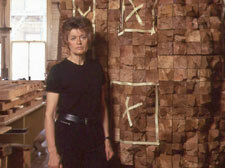 Her work is collected by many of the most prestigious national and international museums and galleries and is regularly reviewed in major art journals including the cover story for the July 2003 Sculpture magazine. Born in Germany in 1942, von Rydingsvard spent her early childhood in Nazi labor camps and later in refugee camps until her parents and their seven children were able to immigrate to the United States in 1950. For von Rydingsvard, wood became the key to unlocking the autobiographical and ancestral content that she has since transformed into metaphor. It is a country known for Machu Picchu, llamas and descendants of Incan culture. Goshen College students will now have the opportunity to study Peru in-depth, and engage in service there.